The UPRIGHT PRO Posture Trainer improves your posture in just two weeks using the latest habit changing wearable technology. In today's reality, most of us find ourselves sitting slouched in front of a computer or tv set for several hours a day, what we like to call - 'screen-slouching'. After years of slouching for such long periods of time, our muscles have weakened and some of us have even lost the ability to sit and stand in an upright position for more than a few minutes without getting sore. We return home after a long day of screen-slouching with an aching back and low self-esteem. While it's easy to feel that we are slouching fixing it through the day and creating a positive habit is just too challenging to do without any help. That's where we come in. Upright Technologies has invented the UPRIGHT PRO Posture Trainer to fix today's severe posture problem. It won't get in your way, UPRIGHT will improve your posture while you are handling your daily life. Just attach UPRIGHT to your back with one of the 60 adhesives that come in the box and start your training while continuing with your daily routine. The Upright Posture Trainer attaches to your back with a small adhesive and vibrates, immediately, every time you slouch, reminding you to correct your posture. Unlike other posture devices UPRIGHT is meant to be worn for short posture training sessions of only 15-60 minutes per day. After a short time of using this discreet posture trainer, your body quickly learns to maintain good posture even when you are not wearing the device. UPRIGHT has already collected thousands of success stories in improving people's posture and overall well-being. Get your UPRIGHT Today and see improved posture in just two weeks. WEARABLE TECH: UPRIGHT's products are the only posture wearables that go directly on your back for the most precise measurement and feedback. Developed hand-in-hand with back surgeons and chiropractors. POSTURE CORRECTOR: See a noticeable improvement in your posture in as little as two weeks of training. Training session are done while sitting for 15-60 min so they won't take up your entire day. 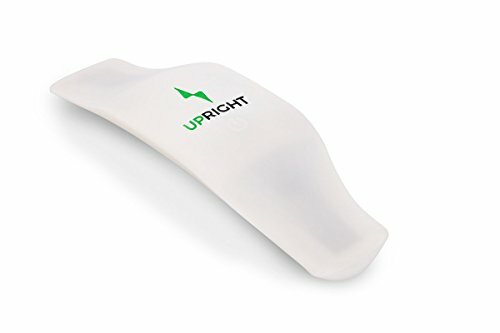 POSTURE TRAINER: UPRIGHT PRO attaches to your upper or lower back, accurately detects when you are slouching with unique technology and vibrates to train you to sit in a comfortable Upright position. POSTURE MONITOR: Personal training program and 24/7 in app customer care team keeps you motivated to train consistently, meet your goals and have better posture in no time. IN THE BOX: UPRIGHT PRO posture device (made of medical grade silicone), USB charging docking station, 60 hypo-allergenic adhesives, Free iOS & Android App. If you have any questions about this product by Upright, contact us by completing and submitting the form below. If you are looking for a specif part number, please include it with your message.